Six years ago, an eagle-eyed member of Chester Zoo’s digital team identified the unstoppable rise of mobile users in analytics reports. Now mobile has become a key component of every digital decision the zoo makes. And the whole journey has been achieved based on a single Sitecore platform to remodel the mobile experience from website to app and beyond. 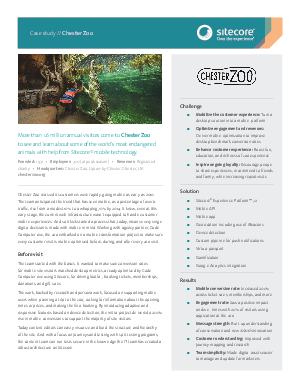 Learn more today by downloading the Chester Zoo Case Study.